I took this picture at the end of September when I was wandering around downtown Chicago. I’ve written in the past about Chicago’s eclectic architecture and how it all seems to work well together. Here is another view of some of the most diverse buildings smack-dab next to each other. 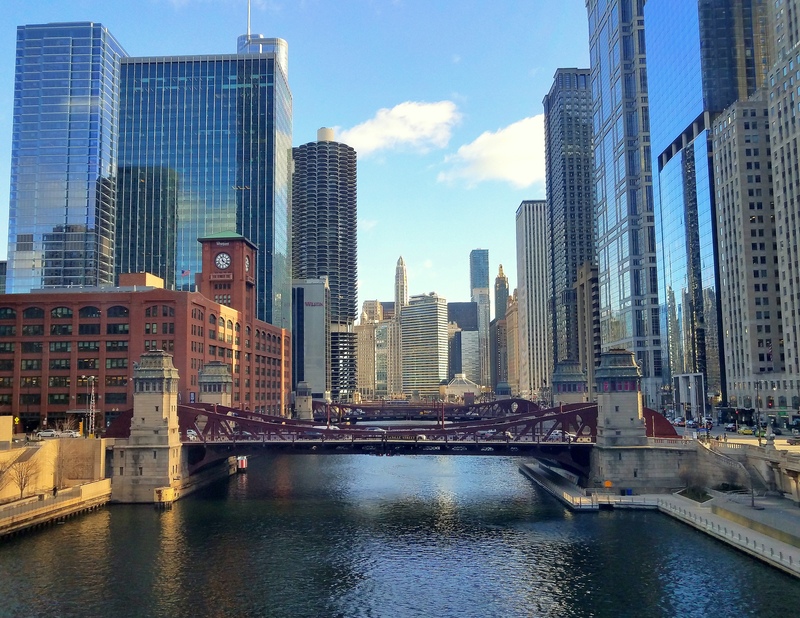 Blending old and new, this scene is part of the beautiful walkway along the Chicago River. Do you see the building that has a gold(ish) tone on the top of it? Built in 1929, the “Carbide & Carbon Building” is an Art Deco style, one of my all-time favorite architectural designs. Known as the ‘Champagne Building’ for its similarity to a bottle of champagne, the top appears to have a gold foil look, while the rest of the building is a dark green hue. I must say, it does resemble a champagne bottle a bit, don’t you think? Now, if there were buildings on either side of it shaped like champagne flute glasses, why, I suppose not much work would get done, would it? Celebratory water cooler breaks, perhaps. I’m going to have to pay a visit to this ‘bubbly’ building one of these days and shall report back with my findings! There’s no place like downtown Chicago, you’ve captured it beautifully.